Part of the series: What are we going to do about Jesus? What are we going to do about Jesus? It seems in many cases, Jesus and the Apostles, for that matter, just did not get the theological memos that I have been getting all my Christian life. Today we will look at what the New Testament says about how we will be judged. You are probably wondering, why such a provocative title. But I am serious. What are we going to do about Jesus? Marc Carrier, an African missionary, was speaking back in 2013. He said that on judgment day we would not be standing before the theologians. Instead, we would stand before Jesus. After hearing him, I decided to study the judgment as Jesus described it. As I read the New Testament I found there was nothing that I was taught that even resembled how we would be judged, as taught in the bible. I was taught that since I was “saved” meaning, I was sorry I was a sinner and trusted in what Jesus did on the cross to pay for my sins; I was going to by pass judgment and judgment day in some way. Now there were going to be rewards for me, if I was faithful, and there might even be a moment of regret before Jesus wiped my tears away for, perhaps, wishing I had been more diligent. Certainly there is a promise of reward, in the way of crowns mentioned in the bible. There seems to be cities rewarded to the faithful in stories or parables of Jesus about His return. That about sums it up. In fact I can do a google search and find those same teachings in a variety of different forms and versions. Basically boiled down to the fact that, I will not be judged. I will point out two verses that are mostly quoted. There is John 5:24 where Jesus says whoever hears His word and believes has eternal life and will not be judged but has passed over into life. We will look at this verse in context later. And of course we have verses like John 3:16 that tell us that Jesus died that we might have eternal life. What I want to do is visit the verses that specifically mention judgment. I do this for a reason. Many today, like to take the plain and clear scriptures that are hard or uncomfortable and just negate them via a verse that seems to point a different direction. A direction that is not dealing with the issue directly but is easier and sometimes, seemingly, the opposite of what the bible says in the hard verse. A perfect example is where Jesus teaches how we are to treat our enemies and clearly calls for a radical form of love. Turn the other cheek; bless those that curse us, pray for those that are persecuting us. It seems unreasonable, costly and frankly scary to live this way. So what do we do? Do we cry out to God for courage and faith? Do we pray and fast for God to change our hearts? Sadly, most run to theologians, pastors and commentaries that point them to an unrelated verse or vague concept with religious wording to address the topic and claim this text or train of thought gives us permission to disobey every clear verse dealing with the issue. One thing I have observed is that theologians are always negating Jesus’ plain teaching, and the call for taking up my cross and giving up all for Jesus was just a false alarm or a misunderstanding. Let us remember eternity is at stake. I assume when it comes to judgment you want truth not evasion. Let’s just read the verses for what they say. Ever hear of sola scriptra? Men say they follow it but then quickly begin using theological Buzz words not found in scripture and quoting the precepts of their favorite theologians. Funny how that works. Let me share just a few verses about judgment, and then comment. Now, I was told, I would not be judged. Did you notice Jesus says every man? Well if that is right then Paul did not get that memo either. 2 Corinthians 5:10 For we must all appear before the judgment seat of Christ, so that each one may be recompensed for his deeds in the body, according to what he has done, whether good or bad. Did you notice that Paul is writing to the Corinthians and he uses the word ALL, when speaking of who will appear before the judgment seat and be judged? Yeah I know, you have been told all seems to never mean all by your theological peers. Trust me, I looked it up. All actually means all. Romans 2:5 But because of your stubbornness and unrepentant heart you are storing up wrath for yourself in the day of wrath and revelation of the righteous judgment of God, 6 who will render to each person according to his deeds: 7 to those who by perseverance in doing good seek for glory and honor and immortality, eternal life; 8 but to those who are selfishly ambitious and do not obey the truth, but obey unrighteousness, wrath and indignation. Did you get that? He will render to each according to his deeds, on the day of wrath. Then he said glory and immortality to those who persevere in DOING GOOD and to those that do not obey, wrath. Now I was taught that since I prayed the prayer, the sinner’s prayer, and really meant it, I was safely guaranteed heaven. There would be no judgment, but that God would only see Jesus when He looked at me. Well, then why don’t Paul and Jesus seem to mention that? Am I going to stand before a theologian, a pastor or a warm and fuzzy Christian book? No, I am going to stand before the Lord. What does the bible teach? That is the issue. Why do the verses that specifically mention judgment and judgment day say “everyone” and or “all” will be judged? Why do they say I will be judged by works, deed and obedience? Many claim that the judgment seat of Christ is not final judgment to determine our eternal destiny, but rather to judge our actions. This is said to be where a believer would get his or her rewards or perhaps some disappointment. However, this verse clearly juxtaposes eternal life with wrath. No mention of rewards or crowns. The bible makes no distinction between one judgment or another. Theologians do, the bible does not. I am a simple guy. And I believe we serve an awesome God. I believe that we can trust Him that He has communicated His will and truth in a way we can grasp and understand. Let’s look at what Jesus and His disciples taught about this subject. Here is some New Testament verses on the topic. In these verses, Jesus is teaching disciples, the lost, and religious leaders. Basically, all walks of life and standings with God are listening. In many, only the Apostles. We will look at verses using the words, judgment, judges, hell and or punishment. Matthew 5:22 says that anyone who is says racca to his brother is in danger of the fires of hell. This is in the Sermon on the Mount. It says in the bible that Jesus saw the multitudes, but then sat down with His disciples and taught them. He is speaking directly to His men, the disciples. Matthew 7:21 Not everyone who calls me Lord, Lord will enter the kingdom of heaven, but only he who does the will of my father who is in heaven. Matthew 10:28 Jesus tells the Apostles not to fear men but God who can destroy both body and soul in hell. Matthew 10:33 Jesus says that whoever denies Him before men, Jesus will deny before the Father. Again, spoken to the Apostles. Luke also gives the same illustration. Why does Jesus tell his disciples this if they can’t be denied? Is He lying? The great theologian Augustine said that just because the Lord says something it does not mean it will or can be done. Do you think God says or calls men to do things they can’t or won’t be able to do? If so you will certainly need a theologian to tell you the truth for God and His sola scriptura could not be trusted at all! Matthew 12:36 Jesus says we will be judged by every idle word or acquitted by what we say. Matthew 16:27 Jesus says, each person will be judged based on what he has done. In some versions, according to his works. Matthew 18:8-9 is a very interesting verse. Jesus says that it is better to have ones hand cut off or eye plucked than to enter hell with both. What does this verse imply? Again this verse is in a chapter where Jesus is having a talk with His disciples. The crowds are not even around. He says it is better to ruthlessly deal with things that cause sin, so as to avoid hell. This is not what I was taught at all. I was told just to believe. Be forgiven and I would miss judgment. Jesus seems unaware that the disciples beliefs would trump being judged. I thought if I believe I am in heaven. End of story. This same teaching is repeated by Jesus in Mark 9:43-48. Matthew 18:22-35 Here, Jesus tells a parable. In it a man is forgiven by the king and then does not forgive someone that owes him a debt. The King finds out, turned the man over to be tortured and Jesus says that it will be like that for us if we are not forgiving. Again, this is a chapter that is a conversation with the disciples. Matthew 25:14 Jesus tells of three men. All given a trust from the Lord and one does nothing with it. Each man is judged when the King returns. Each by what he has done. One is judged and thrown out into the darkness where there is gnashing of teeth. Matthew 25:31-46 we see the story of the sheep and the goats. At judgment day people are divided, not by their faith alone, not according to having prayed a certain prayer, no predestination is mentioned, nothing says the elect are on one side and the non elect are on the other. Sheep are those that loved the least of these and goats are those that didn’t. Again, these are works, deeds and actions. People that thought they were safe, find out in this judgment day prediction, that they are doomed. Then they actually argue with Jesus. Let me ask you a question. Are you arguing with scripture on judgment right now? You may be mad at me. Are my observations logical and the most literal and natural responses to these verses or do I sound like a theologian? In a stunning quote, Jesus in John 5:28-29 warns us NOT to be amazed. There will be a judgment and those that have done good will be resurrected to life and those that have done evil will be condemned. Pretty clear. Jesus says we will be judged by what we have done. This is the text I mentioned earlier that is given to prove we will not be judged. Let’s read the verses. Once again we see those that have done good, will go to life and those that have done evil to judgment. They pass from death and judgment to life when they believe, but as we see later that does not mean that one time belief is the basis of eternity. rather, according to Jesus it is how they lived. You may be thinking that Jesus taught these things before He died for our sins and rose again, granting us forgiveness. Some teach there is one gospel involving works for the time Jesus was here and another regarding belief or faith now that He is crucified, dead and rose again. There is no text to verify two gospels for two different times and two different people. Scripture says that the Faith was delivered once and for all. There are not multiple Faiths in Christianity. But Jesus not only spoke in the Gospels before He died but spoke again in Revelations after He died and rose again. Did He speak of our missing judgment day? Did He speak of our being judged by our works? Revelations 20:12 speaks of the dead being judged according to what they had done. But what does Jesus say? In Revelations 22:12 Jesus proclaims, in red letters, in my bible, that He will judge according to what we have done. This is after He died and rose again. No mention of any change in His message on this topic. No mention of distinction between the lost and the believers. In fact Revelations was sent to believers. No unbeliever would even hear this comment by Jesus. It was not an oral teaching preached in the town square, it was Jesus proclaiming it in heaven within ear shoot of John who was told to write these things down, accurately, in this apocalyptic letter directed at churches. What if I am wrong and Paul did give us the final answer on the Gospel and judgment. Many theologians that dismiss Jesus’ hard teachings run to Paul for the truth. Let’s see what Paul and the other Apostles say. Beginning in Romans 2:1-5 Paul warns the Romans that if they live hypocritically they are storing up wrath for the Day of Judgment for themselves. He actually asks if they think they will escape judgment. Did you hear that? Paul asks Christians in Rome if they are foolish enough to think they will escape judgment. Are we also foolish enough to think we will escape judgment? Later in Romans 2:16 Paul says God will judge the secrets of men according to the gospel he taught. Funny, that is the same thing Jesus taught in His gospel. I shared earlier where Paul says in Romans 14:12 each one of us, (speaking to the Church in Rome), will give an account to God for himself. Now we do have a verse that warns leaders that their works will be rewarded if done correctly. And we are told that they may suffer if they build wrong, but will still be saved as though through fire. 1 Corinthians 3:10 By the grace God has given me, I laid a foundation as a wise builder, and someone else is building on it. But each one should build with care. 11 For no one can lay any foundation other than the one already laid, which is Jesus Christ. 12 If anyone builds on this foundation using gold, silver, costly stones, wood, hay or straw, 13 their work will be shown for what it is, because the Day will bring it to light. It will be revealed with fire, and the fire will test the quality of each person’s work. 14 If what has been built survives, the builder will receive a reward. 15 If it is burned up, the builder will suffer loss but yet will be saved—even though only as one escaping through the flames. We have a context here where Paul is specifically addressing those, like him, building on the foundation of Christ when instructing the body in the truth. This is a verse clearly addressing teachers and so called apostles coming to the Corinthians and teaching things Paul did not preach. So this is a judgment for teachers concerning their work in their ministry. Let’s continue with Paul. While 1 Corinthians 6 does not mention judgment day in verses 9-10 Paul ask a question. Do you not know that sinners, (he then list specific sins) will not inherit the Kingdom of God? This is written to the Corinthian church who he says at the beginning of the letter are sanctified and holy in Christ. Are the sanctified and holy in Christ, Christians? I certainly think so. Then how will they be excluded from the Kingdom of God if not in judgment? Both presently and eternally. If they, Christians, have sin in their lives, like those listed, they will suffer judgment and not inherit eternal life. Or do we believe that we can be excluded from the Kingdom of God but admitted into eternity? Let’s move on with the book of Hebrews. Again, a book written to people the author calls holy brethren, partakers in the heavenly calling, sprinkled by the blood and holding fast to the confession with a pure heart and a clear conscience. I hope we can agree this is written to Christians, unless one wants to argue that one can be an unbeliever and be holy and hold to the good confession or be a person that does not believe, but has Jesus as his high priest. I have actually heard from theologians that this book was not directed towards believers. Apparently, these unbelievers were encouraged to call the elders to pray for the sick and wait patiently for the Lord. Strange words of instruction for the lost. But theologians seem intent on relegating this book to irrelevancy, for believers, due to its troubling verses for those holding to reformation theology. But that is another subject. Chapter 10:26-31, instructs those Christians that if they willfully sin, they will face a consuming fire at judgment. Not a fire that burnt up their ministry works or the wood, hay and straw of their teachings. No, it tells these believers warning them of people dying in judgment in the OT and alerts these Christians that it is a terrifying thing to fall into the hands of an angry God. A somber warning indeed. I was stunned when I made this study. If I am saved by faith and grace by my precious Savior, why does the bible keep saying that I will be judged by works? I always go back to James talking about faith and works. Faith without works is dead faith. And James asks if we believe that dead faith is saving faith. The obvious answer is no. I want to make a suggestion. Read the book of 1 John. I urge you to read the whole book. It is written that your joy be full and also, it is the only book written that you may KNOW you have eternal life. In John, you will find that if you don’t obey His commands you don’t know Him or love Him. If you continually sin you don’t know the truth. If you live righteously, you are righteous. If you don’t you are not righteous. Why does John not tell us that if we are elect, this is a none issue. Why does Paul not just admitt that if we are the elect or are predestined before the foundation of the earth for heaven or hell we need not take his admonishions? That is because when the Bible speaks of choosing it is always with instructions as to why the choice was made and what is the goal of the choosing. For Israel it was to be a holy and peculiar people, showing forth the praises of God a light to the Gentiles and the world as they were to marvel how great the God of Israel is. See Nebuchadnezzar. Paul was specifically chosen as a wittiness to the Gentiles. No mention of heaven or hell for either of theses great examples of choosing. We are told in 1 John 3 that whoever has this world’s goods and sees his brother in need and does nothing, does not have the love of God. We are told that if we don’t love our brother who we see, we do not love God who we don’t see. There is no ambiguity here. If you love God you will love the brothers in a practical way, if they are in need. Do you see how there is no divorce between works, deeds and belief? We have somehow divorced believing, loving and obeying. There is no such divorce in scripture. We are not saved by our works; and we are not saved by faith without works. My dear brothers and sisters, I want to join John and tell you that if you don’t have faith with the works of obeying the commands of Jesus, sharing with your brothers and sisters in need, then your faith is dead faith. Jesus will judge you by your works. It is safe to do so. Jesus said a bad tree does not bear good fruit and a good tree bad fruit. Again, He said if you love me you will obey me. If you don’t obey Him, the verdict is in, you don’t love Him. If you see your brother in need and don’t help him, the verdict is in, you don’t love God. In John 15 Jesus talks about abiding, obeying and loving. 8 This is to my Father’s glory, that you bear much fruit, showing yourselves to be my disciples. 9 “As the Father has loved me, so have I loved you. Now abide in my love. 10 If you keep my commands, you will abide in my love, just as I have kept my Father’s commands and abide in his love. 11 I have told you this so that my joy may be in you and that your joy may be complete. Abiding is done by loving and obeying. No obeying, means, no loving, no abiding. It is explained as you read this entire passage that we bear fruit if we abide and if we don’t abide we don’t bear fruit. If we don’t bear fruit we are cut off by the Father and thrown in the fire. Loving and obeying Jesus is synonymous with bearing fruit. Just as Jesus obeyed the Father and was able to abide in His love so we must obey and abide. So what are we going to do about Jesus? You and I will not stand before Luther, Calvin or your pastor and certainly not a commentary. According to this verse, above, if you don’t obey, you are not a disciple of His. Perhaps you are a disciple of Luther or perhaps Calvin. But if you don’t obey you are not a disciple of Jesus. Jesus says so. So Glenn, should we live in fear? My answer is yes, then no. Peter tells us to live in reverent fear because we will be judged. Again, written to Christians. 1 Peter 1: 17 since you call on a Father who judges each person’s work impartially, live out your time as foreigners here in reverent fear. 18 For you know that it was not with perishable things such as silver or gold that you were redeemed from the empty way of life handed down to you from your ancestors, 19 but with the precious blood of Christ, a lamb without blemish or defect. Did you get that? We were redeemed from an empty way of life by the precious blood of Jesus and will be judged impartially and should thus live in light of that coming judgment. Paul makes a startling statement. Paul, the chosen. “But I keep under my body, and bring it into subjection: lest that by any means, when I have preached to others, I myself should be a castaway,” 1Corinthians 9:27. Castaway is the Greek adokimos, one disapproved by the judge as not having fairly deserved the reward. Paul uses it again in 2 Corinthians 13:5. There he tells them to examine themselves to see if they are in the faith. Obviously Paul knew Judgement was in his future and wanted to be found qualified. So we see that we should live in reverent fear. We will be judged by our actions. But John makes another observation. If we abide in Him, we need not fear, but can have confidence in the Day of Judgment. I will be judged by my works. Jesus and the Apostles say so. I must keep a reverent fear of God with the knowledge of my certain judgment. I must abide in Him, and live in this world as He lived in this world, so I can then have confidence in the Day of Judgment. My point in the article is that I was told I was going to miss judgment day. However, I learned, from Jesus I will be judged. He said this before He died and rose and repeated it again after He died and rose. Paul agrees, as does Peter. Peter points out that since our Father judges impartially, we should live in reverent fear. We should live as foreigners here in light of this fact. So I suggest we do just that. We are also informed by John that if we abide in Him and walk as He walked, love will be perfected in us and we can have confidence on judgment day. So I pray that this would be so, for both you and for me. Now many will want to quote you favorite verse to me now. “I am saved by grace and faith alone, lest any man boast, by golly”. But in the NT salvation is mentioned in the past tense, the ongoing, being saved usage and the will be saved. You get onto the vine by faith, repentance and baptism. You stay on the vine by obeying Jesus’ commands. He says so. And if you persevere you will be saved on “that day”. The day of judgement. Now many of you may want point out teachings that there are several different judgments for different people. For example, the great white throne judgment, the judgment seat of Christ judgment, the sheep and the goats judgment and another for those that never heard the gospel. There may even be some, hyper preterist that want to tell me about all judgment pertaining to the destruction of the temple in AD 70. I have read and studied them all. The problem is that almost every modern day theory I was taught on the return of Christ and judgment day is a recent innovation. Meaning that the very disciples of Jesus and the Apostles seem to know nothing about it. It was many centuries after Jesus, before anyone introduced the preterist views or dispensational views on the end times and multiple judgments. The separation of judgment day into a huge variety of events for different circumstances is simply not found in church history till quite late. The faith was delivered once and for all. And multiple judgment days are not part of it. The word is clear, all will be judged once for their works and deeds. I am frequently asked about giving in Africa. I would love to tell folks that you can send a check to most charitable organizations in Africa and know that things will go as you planned. Unfortunately, this is not the case. As you know, I am writing a series of articles meant to be used as tools for me to use when people ask me questions. I did one on why I don’t do micro loans and I plan others as well. It is a process. Recently, a Christian in the US asked if I would give a young man some money for bibles. This person had friended me on Facebook so I knew a little about him. I agreed. This story is salient to this topic. The young man had been begging me to connect with him and teach him about discipleship, house church and other things he had followed me talking about on FB. So why not. Sure I will take the money for him to get bibles and give it to him. I needed to meet with him anyway so we would proceed. I sent Pastor Fred to met with him first. I clearly explained a bit about our mission via message on FB. Pastor Fred reiterated it in person. He wanted to bring his father, a traditional African pastor. I informed him that I actually taught AGAINST, the traditional Christianity he was mostly familiar with. That I taught that buildings were a waste of God’s money and that any pastor with a church building would find me teaching challenging things to say the least. He wanted me to speak in his fathers church but I declined. I stated that I would meet with him alone at first and conveyed that I would NOT meet with him until he read our literature explaining our teachings and agreed that what he thought I was teaching, was what he was called to do. We teach the gospel as Jesus taught it, not the theological version of the West. You must take up your cross, lay down your life, drop your nets and come and follow Jesus. Like Jesus, we are making disciples not casual believers. You must repent, be baptized and obey the King of the Kingdom of God. He agreed. I got the funding from my friend in the US and scheduled the meeting after confirming the young man read the material. He did not have a copy but did have a computer and could download it for free to read. We set the meeting. He showed up with a pastor and an evangelist. He had NOT read any of the materials and the pastor and evangelist immediately began asking for money to build a church building. Sigh. After I shared our vision I had Pastor Fred and Wilson take him to the bible store to buy the bibles. Instead of buying all bibles with the money they only wanted about 40% for the bibles and the rest in cash for them. My guys warned them that muzungus, white Westerners, viewed this as a betrayal and a serious breach of trust. The Africans persisted. I want to take this example and explain a few things. First, Africans communicate to build relationships. Westerners communicate to convey facts. This is a shame honor culture. Meaning that confrontation is bad. It typically damages and can end a relationships. That does not mean you can’t deal with reality. It just means you need to understand what you are dealing with. I rode a bus one time on a long journey. I turned to a young lady in the next seat and asked her how long to the next rest stop. I explained that I needed to go to the bathroom. She said 30 kilometers. 18 miles. Great I could wait. I fell asleep knowing I would awaken at the stop and be fine. I awoke an hour later. I ask her again how much further? 30 kilometers was the answer. You see here, it is bad manners not to help anther. She had no idea how far the next stop was. Africans, unless they are very Westernized, have no understanding of the value of accurate time and distance. To her, it was very important that she answer my question in a positive way so that I felt good about her answer and was happy. I know this sounds absurd but that is the way it is. I am constantly assured of facts that frankly have no bearing on reality. As you might imagine this has become frustrating and a source of great trial and learning for me. I tell this story to help you understand that she did not want to lie to me. To her, telling me she did not know, was unacceptable. She would view herself as a bad hostess. She wanted me to be happy. And she gave me great hope. FYI, it was about 140 kilometers to the stop and I made if fine. Back to the young man. He very much wanted to become my friend. A friendship with a white man is prestige and honor and potentially a source of great financial gain. To have me as a friend and colleague would be the equivalent of him getting his doctorate. It is likely he had every intention of reading the materials, but lacked the funding to get online with his computer. It is also likely that he had shared his good fortune in getting me to talk with him online and had shared it with his father. After having communicated that with his dad, I am sure his dad ask him about it often. In his enthusiasm of getting to met me, I am sure he shared this with his dad and, frankly, did not have the wisdom nor skills to deny his father come. And of course his father had shared with his evangelist friend. I am lucky 10 guys did not show up. Of course the young man shared NONE of my information in the emails. Nothing about not building structures nor about the cost of discipleship. Hence the immediate request for money for a building. Now onto the money. In Africa, once you give someone money for something, it now belongs to the person that you gave it to. It is not yours. It is none of your business. An honest and Godly man will spent the great majority of the money exactly or nearly exactly as you meant it. However, things are different here. It is completely possible and in fact likely, that since the person made a request to you other factors have come to bear. For example, the brothers may not have had the fare to to come to meet me and had to borrow it. They will have to pay it back. It could be that you sent money for a cow but that the price changed so they just bought milk and maize instead. That is acceptable here. In fact, they may explain this to you and ask for the money again to buy the cow. It would not occur to them that you would not understand. I am constantly sent money that is ear marked. It is hard for me to have 500 dollars for a widow I won’t see for two weeks and stand in front of a house with starving orphans with almost nothing to give. I can find a way. It is within my power to responsibly deal with this situation. Africans, on the other hand, don’t have the obligation, nor skills to deal with this all the time. They would just take the money earmarked for one thing and spend it on the greatest most pressing need. In fact you need to understand a few things here. Pressing needs come first. Forget what the earmark is for to an African. It may go to exactly what you want, at least some of it, but it might go to something else more pressing. that is acceptable here. And not dishonorable. I am sorry to say that many Pastors and leaders here know what Westerners will and won’t give to. You will help widows and orphans. You won’t send school fees for the pastors kids to go to a private school nor build him a badly needed house or a perceived need of a car. So he says he has a widow in need and he buys a car. That is the reality here. It is an example of the corruption that goes on here from Bishops down to deacons. It is horrific in Kenya especially. Entire ministries are set up online that are completely bogus. Are they run by conman and thieves? Nope. Bishops and Pastors. Complete teams of them. They have also learned that the more other pastors involved the more likely you are to think they are trustworthy. And by the way, they praise God for answering their prayer for the new car. They spend their time asking Westerners for money. I have actually overheard a conversation between two pastors. One ask the other what he had been doing. Evangelizing? NO. Shepherding? NO. His answer was, seeking money from Muzungus, (white Westerners) as usual. We brought the prosperity gospel and the easy believism of the West here and they have bought it hook line and sinker. We sowed this seed and this is the harvest. On to the next point. It is their money. You gave it. They can do what ever they want. I know of a man locally that went to the neighbors for help for a terrible medical need. Everyone gave generously. So generously that he had more than enough. So he kept soliciting. He got enough for the medical need, a laptop and a new Iphone. He did not stop he just kept going. I have had to confront, yes confront, a team of pastors that I knew had raised enough for a plane ticket many times over and they just kept going. I can tell you that in this case I ruined any chance at fellowshiping with these men again. I was so angry that I trembled. I was so angry that I raised my voice. I was furious, as the money was to transport my dear friend Paul Imam to be buried in his home country. Men that had never visited Paul in the hospital nor seen him in years came out of the wood work fundraising for a cause they would never contribute to. This is common here. So the brothers took 60% of the money and left with it. To my knowledge the young man has never read the materials. We have decided to wait and see if he tries to connect with us again. And if he does, one of the brothers will handle it from here. I am out of this one. I am no longer working or meeting with folks with the where with all to connect with me on the internet. Period. We seek out the poor and lost. Surprisingly, the truly poor seldom ask for anything. They don’t know how. So my advice to Westerners. Give to people you know. To proven disciples. And don’t give to the big Western agencies either. They will eat up most of your funds with overheads and salaries. I don’t know what is worse. An African spending 30% of your givings on widows or a Westerner doing the same. I must say I have little sympathy to groups that pay a CED hundreds of thousands of dollars and have staffs numbering in the hundreds. I know some good folks that are not just MY people. Let me know, I can help. I hope this does not discourage you. I hope it will not give you an excuse NOT to obey Jesus to help the least of these. Eternity is at risk here. following the specific instructions of our King. This was written in response to numerous request about our work in the mission field in Africa and how it might be applied in the West. I hope you have questions and find answers. I am writing it in two parts. One on the commission and one on the method of applying it as taught by Jesus Himself. Read on. By the way. This is not a theory. This is the Kingdom Method of Kingdom Expansion. We are doing this in Africa and it is happening all over the world. I hope it starts in your part of the world. It’s not easy. But it is the way modeled by the King. There are two passages in the Bible we will look at for a plan for biblical insight into missions. I hate calling it that. Missions. That makes it sound like a aberration from being a disciple simply obeying Jesus. It is just the way Jesus taught and modeled to extend the Kingdom of God into the world. Matthew 28:16-20 and Luke 10:1-11. Let’s look at the first of the two passages: The first Matt 28:16-20. You will need to pray for fresh eyes, as these are familiar verses. Lord, I pray you give us fresh eyes to see your word in all its wisdom and meaning. Amen. OK, I know you are saying. “Dude, I know this verse. Let’s move on!” First lets …….Lets break this down. Just bear with me. GO: Our mission includes going. Okay that’s easy so far. But let me point out what is NOT in this simple word. That is inviting people to come to church or a revival. Jesus nor the Apostles wrote nor said anything about building churches and filling them people and inviting the lost to come. Jesus said GO. Get out of your comfort zone and GO to the lost. We must change the culture of Christianity from COME, to church, to GO to the lost. Of course we will always meet together and fellowship. But in the entire NT the church met in homes. They spent their funds they pooled together mostly on each other, the poor, the orphan and the widows. More on that another time. But for now realize that this is not a verse for missionaries. That word is not even in the bible. Missionary. It is for disciples. You know the people Jesus went everywhere with and looking for. In fact when we go, He gives us a great new standard for calling the lost. For lack of another term, lets call it Jesus, alter call. Except as one brother has shared. It is not a call to an “alter” but a call to “alter” or repent. Now for Jesus alter call. Large crowds were traveling with Jesus, and turning to them he said: 26 “If anyone comes to me and does not hate his father and mother, his wife and children, his brothers and sisters–yes, even his own life–he cannot be my disciple. 27 And anyone who does not carry his cross and follow me cannot be my disciple. 28 “Suppose one of you wants to build a tower. Will he not first sit down and estimate the cost to see if he has enough money to complete it? 29 For if he lays the foundation and is not able to finish it, everyone who sees it will ridicule him, 30 saying, ‘This fellow began to build and was not able to finish.’ 31 “Or suppose a king is about to go to war against another king. Will he not first sit down and consider whether he is able with ten thousand men to oppose the one coming against him with twenty thousand? 32 If he is not able, he will send a delegation while the other is still a long way off and will ask for terms of peace. 33 In the same way, any of you who does not give up everything he has cannot be my disciple. 34 “Salt is good, but if it loses its saltiness, how can it be made salty again? “Well that does not sound like any alter call I ever heard!” Exactly. You see we work hard to make converts but Jesus was not doing that. He was not training His disciples to do that. What was He doing? Read on. Make disciples. Ah, I get it. He has a different plan than we do. He is not looking to convert the masses. He is looking to make disciples, who make disciples who teach others to obey the commands of Jesus, and make disciples that obey His commands and make disciples. See a trend? You see if you want a bunch of converts to fill the pews just ask folks to pray the sinners prayer. Jesus and the Apostles never did that. Jesus called for repentance, baptism and warned of the cost of becoming a disciple. He said to count the cost. No begging people to get saved. No pleading with them to avoid hell so they can get to heaven. No, He was saying, drop your nets, take up your cross and give up everything and come and follow me. He said this to the masses by the way. Not to the Apostles. It was to people like you and me. Why? Why, is it so important for people to be disciples and not just converts. Making converts is not Jesus way. I wonder why? Marc Carrier, tells of an evangelist that leads someone to Christ every day for 15 years. And he tells of a disciple maker that makes only one disciple every year. Let’s look at the math. The evangelist at the end of the year has 365 new converts. At the end of five years he has 1825 and at the end of 20 years he has 7300 converts. And then he dies. The work is done. Praise God for this faithful man. Then there was this other guy. He had the crazy idea to obey Jesus and follow the great commission and NOT make converts but to make disciples. And when disciples are taught, the great commission, they know they are to obey Jesus commands and that means they are to make disciples. But things are a bit slower here. At the end of one year our disciple maker has made one disciples. Numerically speaking he is not showing much fruit. But he is obeying. Two years, four. You see he made another disciple and his disciple from last year made one as well. Slowly, slowly, one a year each. At the end of five years, he has 32 disciples. But then things get interesting. You see disciples multiply. Converts go to church. Of course some lead other to the Lord, go into ministry and maybe even become an evangelist like our prolific brother above. but lets look at 15 years down the road. 32,768. At 20 years, 1 million forty eight thousand five hundred and seventy six. Our disciple maker dies and the numbers just keep growing. Now maybe you understand why Jesus made disciples and not converts. Let’s do it too! Making disciples is different. There is no begging the lost to pray a sinners prayer. Instead there is a call to count the cost and give up everything and come and follow Jesus. That is the way Jesus did it. Why? Jesus was not looking for the masses, like we do. Jesus was looking for disciples. Do you think we should trust Him or the four spiritual laws tract we were given in evangelism class to lead people to discipleship. We want to disciple believers to become and reproduce Kingdom Citizens, not nominal cultural Christians who attend a Sunday service and live life with a Christian spin on things. I am not in Africa to Americanize them. But rather we are teaching the Kingdom of God, as taught by Jesus, using His methods that He personally used in training His own disciples. There is a King (Jesus), He has a realm ( a real Kingdom on this earth and in heaven) , citizens (committed believers) and they obey His rules (commands) because they love and trust Him. The Kingdom of God, in its purity, under His leadership with real world involvement and literal attendance is the greatest culture changing force in the entire world. Read that last sentence again. Is cultural Western Christianity the greatest force for change in the world? It would be if we in Western Christianity followed Jesus and left the theologians out of the equation. And we learn from 2 Timothy 2:2 that disciples make disciples. If you read Ephesians 4: 11-13, you find God gave Apostles, teachers and pastors to equip the saints for the work of the ministry. We think the office holders here are in the ministry to lead the lost to Jesus. But according to this verse they are to equip the saints to do the work off the ministry. We need to quit looking at the relationship of Jesus and the Apostles, as some holy special once in history event, and start understanding that we are watching the King of Kings, model making disciples. We too, can learn from The Master, disciple maker. Jesus called the disciples to be fishers of men because He was a fisher of men. He promised to teach them to fish for men and then teach others to obey His command. It was and is His intention for you and I to be disciples, making fishers of men. ALL Nations, or as I like to say, all over. We must remember that our mission is mobile, fluid and flexible. God is at work everywhere we can’t get overly committed to an area, but rather stay committed to the vision of Kingdom Expansion. You will have to get out of your comfort zone to do this if you obey Jesus. Let me share what works for me. I discovered something about the poor studying the NT. Listen carefully. Remember two things. Jesus said the harvest is plentiful and the workers are few. Does your work to reach the lost seem anything but a venture involving plenty? I think the Word tells us why. We are told in James 1:5 that the poor are rich in faith. Jesus rejoiced that the truth was revealed and accepted by the simple and hidden from the wise. Jesus is right. The harvest is plentiful. Then He gives us a hint where to look and where we might not get results. The poor are rich in faith and it is harder to get a rich man to heaven than a camel through the eye of a needle. You will hear this from me many times. Let me give you an easy target, if you are in America, the largest unreached people group is people living in a trailer park. Almost no one targets them. The rich ALWAYS think they have it all together and mostly look down on those who don’t. The rich are poor soil, Jesus said so. We don’t neglect them, we just realize the poor are fertile soil. I recommend you focus there. Just a tip. Again, back to the verse. BAPTIZING Baptism is an integral part of spreading the Gospel. It cannot be over emphasized and was a foundation in the Great Commission. It must be foundational to us as well and we cannot leave it out of our message. Jesus and the Apostles didn’t. Repentance and baptism go together. In fact many times it is called the baptism of repentance. Repent and be baptized were hallmark of John the Baptist preaching. And if you add the commands of Jesus and the Kingdom of God you have the hallmark of His message. And Peter’s first sermon ends with a call to repent and be baptized. If that was the way for Peter, John, and Jesus should it not be for us. Theologians have robbed us of the importance of baptism. All wrapped up in the argument of faith and works. That debate never even included the subject of baptism both in the New Testament nor the writings of the early church. Yet theologians have eviscerated the importance of baptism in their zeal to protect a basic point in their beloved reformation theology. Jesus went preaching and had His disciples do the baptizing. He was teaching them how to do it. He was disciplining them on its importance. They may have baptized literally tens of thousands during this time. They learned the lesson well. If your Lord and Savior, spent time training His disciples to baptize, so should we. Recently, I had some preacher actually saying that Paul did not preach repentance because that was only the gospel while John and Jesus were ministering. I guess someone forgot to read their bible. Acts 26:20, Paul talking to King Agrippa, ” First to those in Jerusalem and in all Judea and to the Gentiles also, I preached that they should repent and turn to God and prove their repentance by their deeds.” Another has pointed out that Paul made a point out of saying that he did not baptize many. So it must not be important. Does not surprise me. Jesus, Paul’s Lord and Master, baptized NONE. You see Jesus was teaching others to do it. He did this by having them do it over and over again perhaps thousands of times. It would have been unheard of for them to disassociate baptism to repentance and faith. I am sure Paul was doing the same thing. Having his disciples do the baptism. It’s the best way to learn. TEACHING THEM TO OBEY: EVERYTHING I HAVE COMMANDED This command is many times left out of the Great Commission all together. This is a huge part of the Great Commission and we tend to gloss over it. Depending on your denominational bent, we teach how to get “saved”, how to witness, a few important doctrinal points to avoid error, the importance of bible reading, mention baptism and going to church etc. And those things can be wonderful. But are they everything that JESUS commanded? Let’s be honest Jesus taught to repent, drop your nets, take up your cross and follow Him completely. Then He gave specific ways to live that included loving God and your brother in ways that sound outlandish to the world and again, thanks to theologians, to us. He taught that we are to turn our cheek even to our enemies. We are to give to those in need almost recklessly, with little regard to our own well being. We radically value relationships with our brothers, neighbors and yes our enemies. I could go on, but basically we take the words of Jesus that “He who loves me obeys my commands” and we teach that those commands are to be seriously obeyed. Jesus said on judgment day we would be judged by the very words that He taught. He also says in John 12:47-50 His teachings came right from the Father. Don’t listen to the theologians. Teach the radical laws of the Kingdom of God. They were the sermons and commands of Jesus in the Sermon on the Mount and the Sermon on the Plain. I suspect there was a sermon in the village, a sermon on the water, a sermon in the desert and a sermon in the city. And I suspect like the one on the mount and the plain, they were the radical teaching of a new kind of Kingdom. Remember, the Tutsi and the Hutu sat next to each other in church, in Rwanda for years. They were one of the most evangelized peoples in Africa. They had heard the easy believing gospel of the West. They had not been taught to OBEY Jesus commands. And one day genocide began. I read the testimonies of the killers. One told of being a Christian and a believer before he killed, during the killing and even now in prison. He regrets that the whole genocide thing happened. He says he won’t kill anymore. He is tired of it. But for the life of me, nothing this guy said sounded like repentance. You see in his theology, taught in the West, he was saved by Jesus from his past, present and future sins. Even though the NT specifically says murderers will not inherit the Kingdom of God. You see his theology was all about believing, but knew nothing of obeying. Belief and obedience were never divorced in the NT. He hacked almost a hundred people up. His neighbors. Theologians won’t judge you, nor me, nor the lost we share with. Jesus will. Teach and obey Him. I AM WITH YOU ALWAYS. I am in this forever. (Jesus) What great news. He sends us out and then promises to go with us. Jesus is in the going. Will you go? I will stop here. The rest will come in the next post. The Great Commission is not just for Apostles. It is a Commission for the members of the Body of Christ, equipped for the ministry by the leadership. The next section we will cover is the exact methods Jesus taught on going to the World. Did you know that? Did you know that Jesus gave us exact instructions on sharing and expanding the Kingdom. I can’t wait to share, arguably the most detailed explanation of any teaching Jesus gave in all His ministry. Stay tuned, coming soon! What’s a day in Nairobi like for Glenn the novice missionary? Well welcome aboard here we go. This is pretty much the way a day goes down in Nairobi. Up at 6:30, I have no idea why, I was up late and don’t have much of a need to arise early, but I do. Read 1 John, again, make some notes, pray for the day and some brothers and sisters in need and check in on FB and my hometown newspaper. Breakfast, coffee of course. Out the door at nine. I leave the compound I live at. Normally I try to live among the locals but my brother Imam who just passed, was living in a safe house in a very nice neighborhood. I have been enjoying the mzungu life of running water and reliable electricity. Even hot showers! I leave this environment and head into real Africa. I wave down a matatu. A Toyota passenger van that hauls folks to downtown for about 40 bob. That’s about 45 cents. We circle the neighborhood several times before we are full. No bus heads out of the neighborhood till it is full. Today it took only 20 minutes to fill the bus. That’s a good day. The drive to Nairobi is only about another 20 minutes today. That is very quick. I visit quickly with the driver in Swahili and then get out my Swahili book and study for the 30 plus minutes I am riding. I call my favorite motorbike taxi but find out he was arrested for driving after dark and now has no bike. The local police swept the city enforcing a law they never enforce just to raise some revenue. So I decide to walk to the next bus stop that will take me to the Mathare slums. I decide on a promising short cut only to find out I am quickly lost. Normally I walk this direction till I see the top of the huge mosque and then right behind it is my bus stop. I walk for about 30 more minutes and then decide I better get another boda boda. A motorbike taxi. I see an Apache motor bike. It is a new Indian made bike that I have never ridden so I ask the driver if he will take me. He turns and has very bloodshot eyes. Normally that’s a problem and has led to me having to get off due to drunken recklessness. But I think this guys has allergies. He seems fine. The bike rides amazingly smooth and he is a very capable driver named Robert. He is stunned I want to go to the slums, he tells me he won’t even go there normally. I get that quite a bit here, so I get to tell him about being a missionary and serving the lost and poor. He drops me off and I get his phone number to get a ride later. He is polite and pleased. I meet with the brothers, Pastor Wilson and Fred for a bit. Then I speak in a classroom situation about baptism to a class of new believers. It is a subject that takes some finesse here due to cultural and tribal ceremonies. They circumcise as a part of coming of age here for boys followed by baptism when healed. The girls have a blessing ceremony then they are baptized. Now they have Christianized this time of life meaning there are of course some folks that really do surrender to Jesus at this time of life making their baptism valid on some level. However, I am pretty tough on anyone that has a testimony of a ceremonial baptism. Mostly the whole Christianizing thing just muddles the whole experience. Some inform me that they just had their foreheads crossed with water or in fact did not really understand what was going on. They did not repent and did not surrender to the Lord. Many questions follow, some quite surprising. I would love to just lead people to repentance and faith in Christ and baptize them. But I run into this confusion over the ceremonies so often I decided to address it with new believers and house church leaders in a big meeting so they could address it personally when the questions arose. We lead a dozen or so people to the lord in Mathere sometimes and I can’t interview each candidate for baptism. So this training is great. After the meeting we head out to look at a sisters business site. She shows us her little stall and expresses some challenges. I am making mental notes as to address them as noting opportunities to improve her business that she is blind to. She is a firm lady that although she is about 70 she is spry and newly saved. Firm handshake, strictly business. I like her already. I served cokes at the baptism meeting and she drank three. When she realized that I would not deny her, she could not stop herself. I believe she would have drunk ten if we had them extra. Growing up so poor made this little drink very special to her. Let her overdo it. No harm. All along the slums we walk. The streets are black and soaked this morning. Rained last night here. I can’t describe the slums to you adequately. Tin walls that make homes burning hot when we enter in the day. The streets have human waste in them and children play in the mud holes. HIV, TB, meningitis, malaria and typhoid are everywhere. I am told that TB is so prevalent that everyone, including me, test positive for about two weeks after we visit. Since I come every month you know what that means. It is an airborne disease and it is breathed by all. If that scares you then my advice is don’t come here. That is just life in the slums. The murder rate is high but the police could care less. It’s the slums. No one even knows how many people live here. They technically say 3.3 million people live in Nairobi. 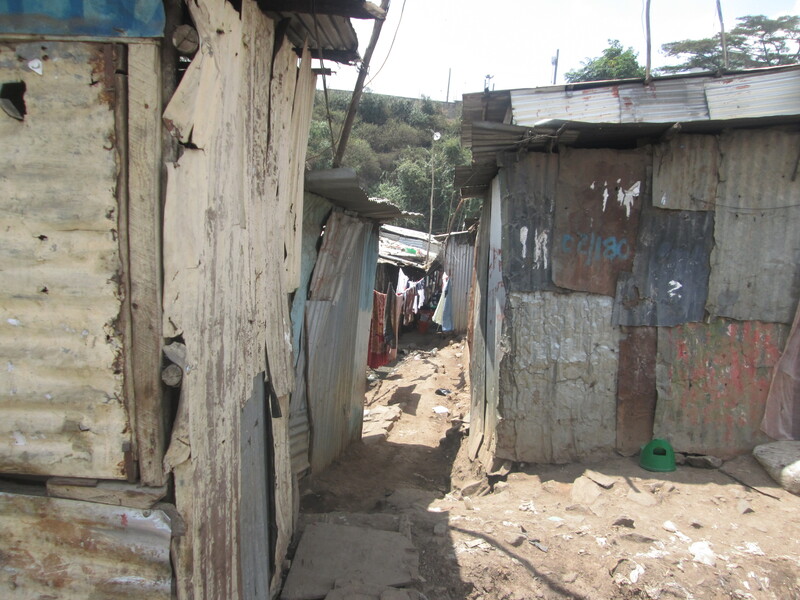 But I am told that with the slums it could be 5-7 million. Some say we are 60% slums either way. I love it here. I have an opportunity to live here or in East Leigh very soon. East Leigh is actually safer from a building security issue, but I will be living around Muslims and some are radicals. The Lord will lead. I will follow. After several visits and some picture taking I call Robert my new driver for the day. He arrives promptly and off I go to do some computer work after picking up some printing and other errands. We weave through traffic in ways that would horrify a Westerner. But I am told African drivers are totally bland compared to drivers in India. I find that hard to believe. But even the Africans say the same thing. I get dropped off about 200 yards from my destination. I immediately see a horrified young white couple pushing two strollers while a street boy, covered in filth and scares, is walking with them and their children, begging for food. I am sure they are terrified that this child will infect their children with something. They don’t want to be rude, but the look on their face is clearly terror. I call to him as I approach and hold up a ten bob. He comes over and I put my arm around him, leading him away from them and give him the coin. I ask his name. Isa he says. AHHHH, I say. Do you know about Isa Al Mashi? He looks up at me. He is not that dirty. Not by African standards. Not by my standards. He shakes his head. I tell him that the Jesus of the bible is the Isa of the Quran. I assume his parents were Muslim, with that name. He then nods, telling me he has heard that. We talk a minute about Jesus but he is only about six. We switch from English to Swahili and talk about his family. His mother is at home but he lives with his aunt. His dad lives in the village back home. After I get near the internet shop I slip him another 10 bob. I tell him I would like to walk home with him sometime so he can show me where he lives. He says he will like that. 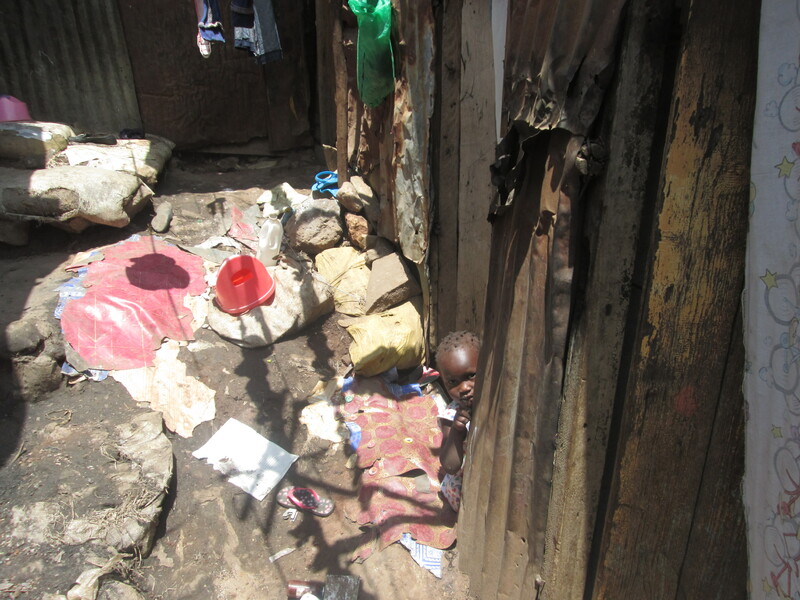 He lives in Kibera. Once it was the largest slum in the world. I have never gone there. Maybe I will go with Isa. Sounds like just the guy to show me around. I like that. I will go with Isa. I post some pictures online and eat supper. I use the free internet to surf the web a bit. I am tired. I call Charles my other boda boda driver and he has now gotten out of jail and can come pick me up. Remember, I told you they rounded them all up the day before. He rides me home on his motor bike and it is raining on us. Hakunashida. No worries. We catch up on the ride home in the rain. I get off the bike at home and give him some extra fare for the ride. He had to pay 20,000 to get his bike out. Of impound. Over 215 dollars. He sold the furniture in his living space to get his bike back. I head in to go to bed. The power is out. Great. I cover my bed in mosquito net and crawl under and light a lamp to read by. Going through Imam’s things I find two great studies on sharing Jesus with Muslims. I also, found a book with world view comments on the scripture from an African perspective. They deal with very different cultural issues here than we do. I won’t go into them now but everything from money, family to friendships are very different than in the West. So verses have very different implications. Things you and I just take for granted are very big issues. Issues that impact cultural norms in a very important way if taught and understood. They have blind spots, just like we do in the West. These books help me understand. 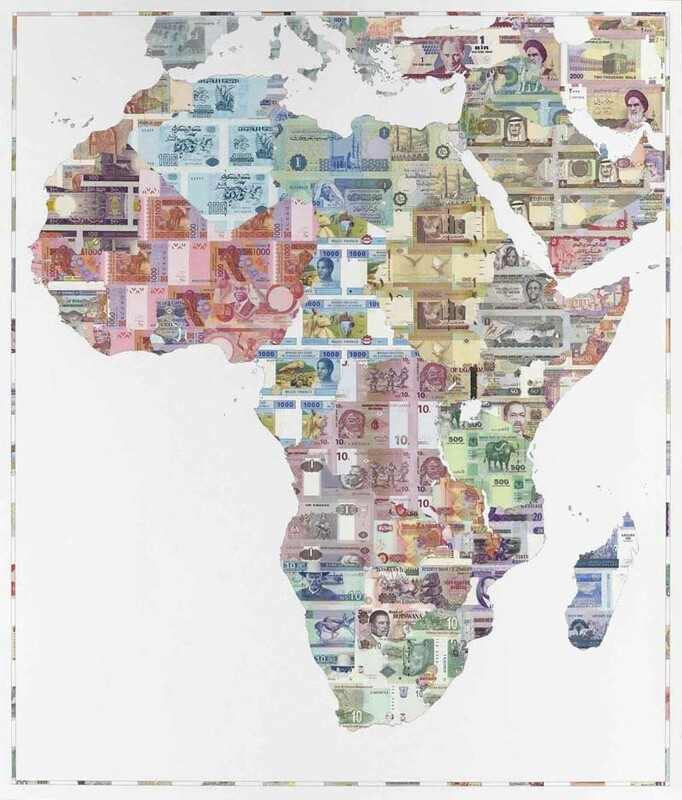 Both tribal Africa, Westernized Africa and of course Islamic Africa. I am engrossed in learning how to impact this culture for the Kingdom. Like Paul walking around looking at the idols in Greece, I study and read about the cultures I am in, looking for ways to extend the Kingdom. What can I use to connect with them? What must I reject and what can be transformed from darkness to light. Pray for me that the Lord would lead me and guide me. Pray that I learn to connect with a culturally diverse community of both Christian, Muslims and Animist. I am reminded of a quote by C.T. Studd. I think he is calling me a turnip head in this quote. I am sure there are better prepared, better equipped, smarter and more talented people called to serve. Sometimes they come. Sometimes they don’t. When they don’t you get someone like me. Pray for me. It’s 11:20 time for sleep. I know it’s not a National Geographic shot but hey, I don’t have a long range lens. This took work. And here is how the story goes. If you go back to my post in the past in the March archives you will find my original adventure Sunday Safari. I found nothing but a huge number of signs. That means elephant tracks and poop. In April I returned and found the elephants, but was literally chased and ran for my life. I have learned much in my little forays onto Mt. Meru. And finally, success. Now on my past journey I announced that I was going elephant hunting on Facebook before I went. I was ambushed on that trip and could only surmise that the elephants had been tipped off by a Facebook spy, posing as a fan. Or, the alternative, they are actually ON Facebook and watching for just my kind of behavior. So this time. NO warning. Just up and go! Like the last trip I left to head towards the mountain three hours before dark. I knew where the elephants would be. All three of my dogs went with me. They think we are now inseparable. Now don’t get me wrong, I like dogs. But frankly can do without them, personally. I merely fed one starving dog out of pity and now I have her two grown puppies to tend to and they think we are a pack. They jog with me every day and on this day went out hunting for elephants. Right away I knew I was low on calories. I had already run today and lifted s little bit of weights with a new brother. So I was not exactly fresh. I asked Mama James for some bananas and we were out. I stopped by the crude shop in our area and they had nothing but cookies. I decided to just stay hydrated and hungry. I entered the forest near where I live. I realized right away that not only did I not have food this time but I also left my compass at home. No worries, I will just try to pay attention. Just a note, this is yet to work. I need my compass. I hiked up steep hills and right away there were elephant signs everywhere. The dogs were panting and probably wondering where we were going. UP and down hills we followed the trails. There were an incredible amount of elephant sign. Much more than I remember. And among them were now, baby elephant sign. The large elephants leave waste behind that could fill a bushel basket every time they go. Large pellets, as big as cantaloupes. But now there were little ones, like little square oranges. I really was excited at the prospects of seeing a mama and baby and fearful of being seen by the elephants with a young one in tow. They are aggressive and dangerous alone. With a baby they are deadly. We walked for over an hour. Every now and then the dogs would venture far in front of me. I was regretting their coming. They were loud and I could tell becoming very thirsty. Then I started hearing monkeys. Monkeys hate dogs. And dogs love to run and try to catch the baby monkeys. Fortunately, they are never really successful. But it has been close a few times. First, they chase some Vervet Monkeys and then the beautiful Columbus Monkeys. But then a strange thing happened. It sounded like a dog was barking from just a few meters away. By now we were two kilometers into the woods and I could not imagine a dog here. I was right, no dog. The puppy of the group I call Happa, went boldly running straight at the barking sound. The other two dogs followed. And then I heard yelping and all three came running back with their tails between their legs. Howling. The older dogs hid behind me and Happa, stopped and then boldly went right back at the barking sound. This time he returned in a dead sprint and unfortunately for me there was a huge baboon on his trial. Did you know that baboons hair stand on end when they are angry and bare their fangs in a most fearsome manner. A baboon can quickly kill a dog and as I said, all primates hate dogs. The baboon was startled to see me standing there. He broke off the chase and returned into the forest. I could see him sitting on a log 30 meters into the trees watching me and then I noticed the dozens of other primates all around him. He was the protector of quite a clan of baboons of all ages. We quickly left the area. It was then I began to think of an exit strategy. I did not want to, necessarily, have to come running FROM an elephant TO a pack of large baboons. I knew it was time for a strategy. The droppings from the elephants were now a mixture of old droppings with some much fresher. I looked down and realized Is was bleeding. A lot. Evidently, my adrenaline as so high that as the baboon attacked I have moved back into some thorns and had cut my fingers and arms. Blood was running off me and onto the ground. I guess my heart was really pumping. I took my pulse and realized I needed to calm down. I opened my backpack and bandaged myself while standing surveying the forest. No time to let my guard down. Do elephants smell blood like sharks? Nah! Finally, I started by back down the trail and found droppings left in the last hour. The elephants were very near. But where? Paths cross this trail from many directions all the time. It is evident from the signs, that the elephants travel all the trails up here, eating and just being elephants. I know I am going to be 57 years old in two weeks, but I simply must spot those elephants from a distance this time and not have them ambush me from 50 feet like last time. I truly thought I was going to be killed on my last trip. I climbed a tree and looked around. I was looking for a high spot to look down on the elephants. I want to watch them, unseen. Besides, everyone has told me that elephants hate thorns and they hate to run downhill. So the ideal situation would be for me to be on a hill, with thorns between me and them and a great way to run down. I could tell from climbing the tree that I was very high on this hill and that I was nearing the area where the elephants should be. I descended noting that at my age climbing a tree would not be a good option of escape. I am a very slow climber. As a kid I swung and lunged at branches climbing with ease. Now, frankly, I thought too much, calculated too long, and moved to slow to evade anything by going up a tree. Scratch that option. Finally, I got to a spot that seemed familiar. In the distance, from a ridge, I spotted a landmark I recognized. Meaning, if the elephants were near where I found them last time, I was within a few hundred meters. I saw a path leading down to where I could get a good look over the ridge. It was then I realized that these jumping running and generally loud dogs might be the best thing for me to escape. I figured if the elephants come after me they would have to choose who to stomp. Since it was me and three dogs I decided that I had a one in four chance of not being targeted. We came to the ridge and I heard one of the same sounds that lead me to the elephants last time. The crushing of branches, munching of leaves and the occasional grunting. There were obviously more than one elephant this time. Of course there were last time but I did not know it until it was almost too late. I am a bit more experienced now. Elephants don’t travel alone. There are always more. You don’t see elephants at first you hear them. And hear them I did. Immediately, I saw two problems. One, the thorns. As I said I was told that elephants hated thorns and if you are chased climb under a big thorn patch. Well. 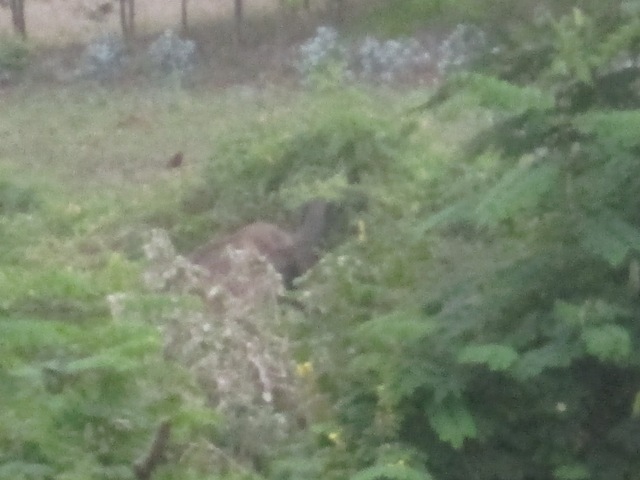 These elephants had actually plowed through the thorns and were eating the trees growing in the their midst. Scratch off, hiding in the thorns. The next thing I noticed was that the dogs, which normally barked and chased anything that moved, were flattened on the ground like pancakes, in terror. The elephant would never see these guys if they looked for me as these little guys had no intention of raising their heads six inches off the ground. Scratch off multiple options for the elephant to choose from if and when they decided to attach. And last but not least, the elephants were down below me but had a clear path to run straight up at me and the only way I could run downhill from here was to run right at them. I was excited to be so near again and sure I would succeed this time in getting a picture, but none of my intel or planning was working out to my advantage. Now I had another problem. There was a huge clump of thorns easily 12 feet high in front of me. The elephants had made a trail going to both the left and right of the clump. I heard two elephants, at least. I am looking at the left trail around the clump, big enough for a truck I might add, when I hear the elephant stop eating and go silent. I hear it began to move towards me very slow. Then I hear another elephant making a noise at the other trail bend. Man, two elephants, one on each trail and I can’t see either one. Then they began to move quickly. But it seemed they were everywhere going in every direction. All the branches below me began to be pushed in directions to both my right and left. I moved to right trail on the other side of the clump to get see if I could see the other elephant and to see if it was coming. I was reminded that the last time this happened they actually came at me together at the same time as though they were in a military maneuver. I thought they would just bluff me and then leave me alone as long as I moved away. I was wrong. There were seriously searching for me to do me harm. Of that I am sure. I looked down at the dogs and realized they were all three sitting at my feet whimpering and staring at me. It was as though they expected me to make this terrible sound and these terrible animals go away. It was apparent they would be of no help in a crisis. About that time to my amazement one elephant trumpeted and began to actually run. This brought back the nightmare of my last trip to this part of the mountain. Running, sweating and fearing for my life. I had no idea which way to run and just froze trying to get some more information before I moved. I did not want to choose a path that lead me to a certain confrontation. 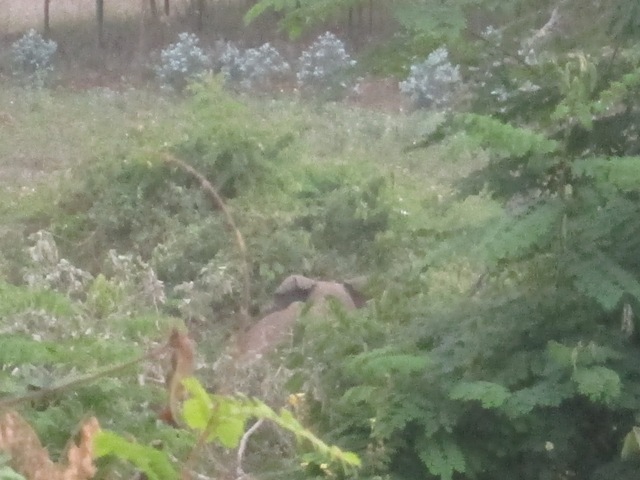 I heard some terrible crashing and another elephant trumpeting then I saw a huge male elephant charging. But, praise God, he was charging at a 45 degree angle from where I was. I don’t know where he had picked up a scent from where we were earlier or thought he heard us over there earlier and perhaps upon hearing us again decided to challenged that position. Whatever the reason, he had now lumbered 150 meters from where we were. He was behind us but It was evident that when he got to the top of the hill, our hill, he was just standing there looking around. The sound stopped. It was then my brain registered that he had run up that steep hill at about twice the speed I could run on flat ground. He was now behind me and there were elephant noise in front of me and below me. Was I being surrounded by these guys? I looked and looked where I thought the sound was coming from and soon realized that the silence of the forest was playing tricks on me. It sounded like elephants 50 feet from me but I finally saw motion two hundred meters away. A momma elephant and her young. They were paying me, no attention. They were just eating. The little one leaned on the mother almost the whole time. In the picture above you have to look to see the little guy next to her. Later, I got a blurred picture of the little guy with his trunk extended. Daddy on the other hand had huge tusk. I now had my pictures; it was time to head home. I worked my way slowly to the left of the momma and baby and descended at a slow rate as not to intercept them. Only the puppy followed. The two adult dogs were so afraid they were frozen to the ground where I left them. Sorry, you will have to come on your own. I am not going to carry you. About thirty minutes later they caught up. I had to be diligent. I was now on the same level of them in the bush and knew they would come this way soon. They travel each night right to where I am walking now heading to feed on corn. I occasionally saw a place on the ground where they elephants dug the grass up and wallowed in the dirt. This is their home. They love it here. They are raising their families here and are willing to kill to protect them. But I am learning the rules. The last time I passed here it was dark, I was covered in sweat exhausted and my heart was racing. But the sun was still up and I would be safe going this way for the next hour. My heart was calm and I was having a ball. I walked home past the dirt homes of some of my house church members. I prayed for them. I arrived home, ate my meal, told my story and studied Swahili, read the bible, prayed and went to bed. I thought about you as I went on my safari. I knew, if things went well, that I would tell you this story. I am not an adventurer. I am just a regular guy trying to take the Gospel of the Kingdom of God to the least of these. People with the same hopes and dreams all people have. To raise their families and provide for them. They just happen to live right next door to antelope, elephants, boars, leopards, monkeys, buffalo and giraffes. And sometimes I take a walk and go visit them. I see what I can see. Thanks for coming along. I hope you enjoyed the adventure. You know you can come and visit and I can show you amazing things. Karibu! You are welcome. I landed in Dar es Salaam ready to get started, but things did not go as planned. I am reluctant in this last post in this series. There is so much that I simply cannot relate to you. I would like to, but I am still working with many of the people that were part of my learning experience and some of that information causes me concern over relationships I value. Perhaps it is better in a book published years from now. But not too many details here. Marc Carrier, my recently visited mentor in Kenya, was running at light speed when I left. His model at that time included seminars teaching the Gospel of the Kingdom, Luke 10 evangelism, the church in the house and discipleship. Basically, applying the methods of our King Jesus Himself. Jesus selected disciples whom He poured His life into. He taught them the Kingdom Ways, Kingdom entrance and then He sent them out training them to go out in twos sharing the Good News. Jesus sent out the 12 then He sent out the 70. We have no reason to believe these were the only times He sent them out with clear instructions to preach the Kingdom Gospel, baptize, heal the sick and proclaim the Good News. Marc was being hosted in churches and by leaders all over Kenya and had a team of brothers and sisters that went with him on these trips to do these teachings. After the first day and a half they took out people and went two by two and demonstrated these methods in person, practically modeling the evangelical part. He did this every week and literally lead hundreds to the Lord and into repentance and baptism in a pretty short time span. Many Kenyans spoke English and he was surrounded by potential translators and disciples ready to assist him in just a few months. I hit the ground, not only inexperienced, but in a culture that spoke Swahili and tribal languages and were very traditional in their Christianity and their tribalism. I had no translator and indeed had no idea where they would come from. My model of taking a disciple, or man of peace that would become my translator, into the field on one on one evangelism was quickly smashed. I interviewed Christians and learned right away that NO ONE wanted to jump on a bicycle with me and take a tent and head out into the bush. That is just not something a new disciple, translator nor newly met brother wants to do. I had people that loved what I shared but were NOT going to leave their families and go off with me. Tanzanians are a very traditional people and everything in their tradition screams for them to fit in and cooperate with existing systems in society and in traditional church. I hired a translator and started doing seminars like Marc. After three or four I decided to go back to those churches and follow up and examine their progress. There was none. Tanzanians love to invite Muzungus in to speak and teach them. They love rallies and tent meetings, big events and big productions. That is what the Western church has taught them. Frankly, they were a bit disappointed I did not come to do crusades. That is what they wanted. So even when the listened to me teach and clapped and praised the seminar, the gains were short term. They were amazed as we went out door to door sharing the gospel. One brother in particular was astounded. He had never seen anything like it. We went out and lead a group to Jesus in repentance. I taught we DON’T then invite them to church but rather we then go to them lead them in repentance, baptize them and get them to invite their friends, family and neighbors to come to their homes and learn about their new faith. We plant a house church right there with those new believers and then disciple and train them to do the same thing. We led Muslims to Jesus that first day. The Psator returned to his church that afternoon and announced he had never seen anything like it. He had tried to get to those same people for years. I later found out that his efforts were to go out and invite them to come to church. To Muslims, he told them that Islam was wrong and they needed to come to church and become a Christian. I, on the other hand, simply shared the gospel of the Kingdom of God. That there were two kingdoms. Jesus was the King of the Kingdom of God and Satan the king of this world system. I shared about the cost of becoming a disciple and invited them to repent and enter the Kingdom of God. The did. I then instructed the leader to go to them the next day and take them bibles, as promise. Then he was to schedule an immediate meeting to invite their neighbors to attend, in their home and begin the training I had demonstrated. And oh yeah, baptize them. Water baptism is an event that needs a bit of planning in Tanzania as in most parts, water is 200 ft down and not readily available for baptizing without a long journey. This requires planning and transportation. I had to go to anther seminar and would have to leave the follow up to this brother. I returned 10 days later. I immediately wanted to know how it went? Not so good. We led them to the Lord on Thursday of that week. The leader never took them the bible. He never followed up at all. He told me they did not come to church Sunday so he decided they were not serious. I immediately went and took them the bibles and got a Christian lady next door to begin meeting with them to do training. These new believers were so poor their children played in the yard naked. I asked the leader why he wanted them to come to his church? He somehow did not digest anything I had taught and simply wanted these and other new believers to come to traditional church. He had no intention of following my instructions. Although he agreed with my teaching while there, it was evident he had no interest in house church. I asked him if he really thought that someone who had naked children was going to come to his traditional church where some members drove cars and everyone dressed up like princes and princesses for each service. I tried to explain how this was just one of the many reasons he needed to disciple them there. In their homes where they lived. I soon learned that almost everywhere I went people enjoyed the seminar, were shocked at the response in the field but then never followed up on the teaching that I brought. They simply wanted some new and exciting lessons from the Mzungu and had no intention of really changing anything or even trying anything new. This was repeated over and over. Eventually, I was invited to a very poor area and meet some pastors who had almost no building and only a handful of members. I shared my usual message but I stayed to model the teaching for weeks afterwards. I eventually began to feel this was God’s plan for me. I moved in with one of the families and became one of them. I shared all my meals with them, and simply did life together. Eventually, I told them I wanted to move to the area and that lead to a wonderful opportunity. They gave me a small piece of land and then came the big surprise. Due to a family difficulty they became aware some distant family members wanted to sell their plots of land on their shamba, or small family farm. They had been denied this request by Babu the leader of the clan in this tribe. The Meru people have a strong tribe and adhere to the old ways. They mostly dress Western but very modestly. The distant family members were told they could not break up the family plot by selling to strangers. They jumped on this new situation of Babu giving me land and letting me move on the property. How could they be denied the right to sell their land when he gave me land right in the middle of the property. Me, a stranger. The solution? I would not be a stranger. I was formally, at least from a tribal way of thinking, adopted by Babu and become his son. Now all Babu had done, was give his own son land. The right of every son. To hold the deed to land on the shamba. I am Wameru. From there I began to plant the first house church then another and another. We have four good ones now and others in the works. Not long after this I was invited to come and do a seminar in Kenya. I meet with a small group of pastors and held my normal seminar. But like Tanzania, these were not middle class pastors with middle class congregations. These were pastors that lived and worked in the slums. They had terribly small and poor church buildings and congregations. They had stagnated in recent years. The prosperity gospel had a strong foothold in this area with promises of a way out and riches for all. But of course the pastors of those churches moved out of the slums as soon as the congregation began to grow and “sowed seed”, money, in hopes of riches. I later visited a couple of those prosperity teachers that now lived in very wealthy neighborhoods in what can only be described as mansions. Well at least the prosperity gospel worked for them. Some opened multiple churches and members flocked to them. Pastors that were not interested in this get rich gospel were left with dwindling congregations and few ideas on growth. So these guys were looking for answers. I assured them my teachings were not going to make them rich. But that if they joined in the work of the Kingdom in a meaningful way, that the teachings of Jesus were the only way to go. Jesus, I assured them, left the roadmap for Kingdom expansion. I left but had no idea if they would follow up without me being there, as that was the case in Tanzania. After about two months they called and said they had 6 house churches. They were excited. I quickly scheduled a return trip and found that actually, one pastor had 6 house churches and the other 9. They admitted they were not prospering financially but the Kingdom of God was exploding. We trained more on discipleship and evangelism. Then, if you have followed my facebook and blog post something amazing happened. We meet with the leaders of each house church after another month or two to learn of their challenges. I quickly learned that these folks were applying these teachings seriously. The house church leaders were literally further impoverishing themselves by helping the poor, widows and orphans in their area. Just as we taught. You see we teach obeying Jesus. Sacricifial giving, turning the other cheek, loving our neighbor, making disciples. 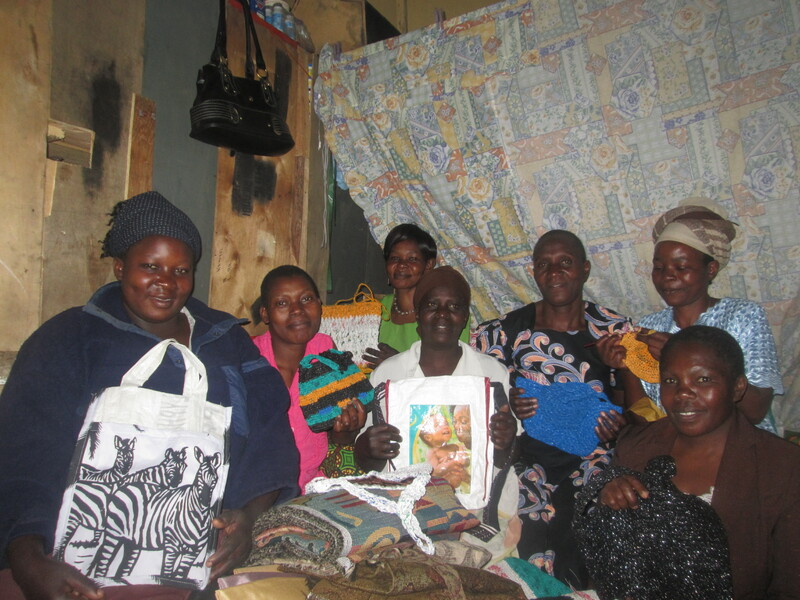 Caring for widows and orphans. These ladies were taking their earnings and spending them on the body. My kind of ladies. I noticed several churches had at least two members that had job skills and in fact little businesses in the slums. Many sewed. I asked those that had skills, what they needed to grow their business. For example the sewers needed an overlock machine. A device that puts the finishing touches on clothing taking them from that home made look to the look of a well finished product, desirable to all. These ladies had to pay someone else that owned a machine to do this work. Owning one of these machines would cut their overhead and because they could now finish their own clothes and it would also create a new revenue stream by using the overlock machine on other peoples clothing. I saw my opportunity. I asked them if they would be interested in teaching other women to sew and in return I would buy them on overlock machine. I did this in faith as I had no money for such a purchase. They agreed. I further stipulated that once the other, newly trained women, got good at their skill I wanted the established sewers to give their old machines to these new ladies and I would buy them new ones. I was confident that if I blogged about this the Lord would place it on the heart of others to give for the machines. I was right. Later we inserted a new product line of purses and things exploded. Now some of my ladies are actually hiring unsaved people from the area and training them as well and leading them to the Lord. I never saw that coming. Then the newly trained house church members learned to share their faith. And now we have over 30 house churches. People that came to Jesus 6 months ago are now going out two by twos and leading others to the Lord. Hopefully, starting new house churches. Later Marc Carrier, my in country mentor, came to Nairobi and shared for about 30 minutes, our mission and the Gospel of the Kingdom, with a brother that worked among Muslims leading them to Jesus through one on one evangelism. I began to visit with him as he stayed in the same missionary house I stayed in, when visiting Kenya. To him it was a safe house. He had fled another country due to persecution and was living there. He had been poisoned, beaten and put in a comma by radicals. I began to work with him each month and now we have 7 house churches in the refugee area. We have a long way to go. But we have come far. I have learned I cannot teach alone. I have to model. I have to demonstrate what I teach. When I do, like Jesus did, people get it. If I want them to share with widows, I have to share with widows with them. Want them to use the proper teachings in discipleship? Then you use the exact methods you want them to use, with them, all the time. Jesus let the disciples watch Him do it, then he sent them out. Hands on real discipleship. We are not meeting oriented, we are disciple oriented. Go into all the world and MAKE DISCIPLES. Not converts, not believers, disciples. Disciples who make disciples, who make disciples. Pray for me as we continue on this adventure in the Kingdom of God. I am just a student. I have so much to learn. I am flawed, but God is Great. And yes God is Good. Especially here in Africa. And I can’t help but add, He is good to me.